Peter Sagan (Liquigas-Cannondale) denied the Swiss crowds a home victory as he took the opening 7.3km stage one time trial of the Tour de Suisse, in the city of Lugano. The Slovakian road champion was only third at the three kilometre checkpoint, near the top of the mid-stage climb, but descended quicker than most to push Swiss four-time World time trial champion Fabian Cancellara (RadioShack-Nissan) off the top. Sagan’s winning time of 9’43” was four seconds faster than that of Cancellara, whose performance had finally pushed Sagan’s Liquigas-Cannondale teammate, neo-pro Moreno Moser out of first place, having been posted in the first hour of the stage. “I'm certainly not a time triallist,” said Sagan. “But over short distances, similar to a prologue, I can maximise my power. On an identical course as tackled in the 2011 race, the Slovakian road champion was 15 seconds faster than he had been the previous year, which meant he could finish ahead of Cancellara, who was six seconds slower. “It was a technical course and I studied it carefully in the morning,” he explained. “You needed to push and sprint, I enjoyed it and felt comfortable. I'm really happy right now, with everything going well. It's a great morale boost, just what I need to continue my path towards the Tour de France. At just 7.3km in length, the Lausanne course qualified to be called prologue, rather than stage one; a climb in the mid part however, which topped out at 411 metres high after 3.2km, meant that this was anything but a typical prologue stage. Spidertech p/b C10‘s Will Routley was the first rider to start, in what was the Canadian team’s biggest ever race, and stopped the clock in 11’30”. He was immediately overtaken by Team Type 1-Sanofi’s Daniele Colli however, who lowered the best time to 11’01”. Saxo Bank’s Chris Anker Sørensen soon became the first rider to go below eleven minutes though, slashing another 28 seconds off Colli’s time to set 10’33”. Sørensen’s time was repeatedly beaten by the riders that followed however - including Thomas Löfkvist (Team Sky), former Swiss champion Rubens Bertogliati (Team Type 1-Sanofi) and Maxime Monfort (RadioShack-Nissan) - then Swiss favourite Martin Elmiger (AG2R La Mondiale) went below ten minutes for the first time, with 9’54”. He himself was only on the top for a few minutes however, as Moser - who’d crossed the 3km check in 5’11” - went four seconds faster at the finish, with 9’50”. Tom-Jelte Slagter (Rabobank) went into provisional third place, with 10’03”, but the ten minute mark was proving a barrier to all but Moser and Elmiger for now. Keen to prove a point after his much discussed withdrawal from the previous month’s Giro d’Italia, Fränk Schleck (RadioShack-Nissan) almost hit a traffic island on the descent to the finish as he raced into the finish, and stopped the clock in a respectable 10’19”. Dario Cataldo (Omega Pharma-Quick Step) meanwhile, who had enjoyed a more successful Giro, went into provisional third with 10’01”, but still couldn’t quite join the leading two under ten minutes. Soon afterwards Jakob Fuglsang (RadioShack-Nissan), who’d missed the Giro through injury, went best of all the overall contenders so far with 10’05” to go into fifth. Finally, Astana’s Frederik Kessiakoff became the third rider to break the ten minute barrier, slotting into provisional third with 9’58”. Big favourite Cancellara was only twelfth at the top of the climb, nine seconds down on Moser. The former World champion almost hit the same traffic island as teammate Schleck had done in his haste to get down the descent though, and, as he sprinted across the line, he finally knocked Moser off the top with 9’47”. Michael Albasini (Orica-GreenEdge) had been second after three kilometres, just three seconds down on Moser, and six up on Cancellara, while Sagan was just a few hundredths of a second behind the Orica-GreenEdge rider. Albasini was no match for Cancellara’s descending though, and crossed the line in provisional fifth in ten minutes dead. While never looking like taking the lead, Roman Kreuziger (Astana) - who had had a disappointing Giro, despite winning one of its hardest stages - crossed the line in 10’02”; going into provisional seventh, and the best of the top overall contenders so far. 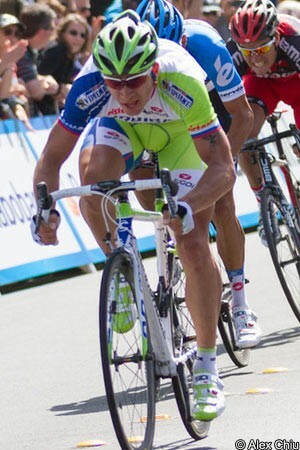 Sagan was displaying the same fearless descending that he had shown on the way down the Grosse Scheidegg in the previous year’s race and, although he was two seconds slower than Cancellara on the way down, the fact that he had been six seconds quicker than the local man on the way up made the difference. The rider that won five of the eight stages of the recent Tour of California brought his sprint into play in the final metres, and reached the line in 9’43” to deny the home favourite his victory. The final rider to start was 2011 race winner Levi Leipheimer (Omega Pharma-Quick Step), who only recently recovered from a fractured fibula, and he crossed the line in 57th place, with 10’24”. SWE 11 Thomas Löfkvist (Sky Procycling) s.t. NED 13 Laurens Ten Dam (Rabobank Cycling Team) s.t. ITA 14 Marco Marcato (Vacansoleil - DCM Pro Cycling Team) s.t. AUS 15 Cameron Meyer (Orica - GreenEDGE) s.t. USA 17 Brent Bookwalter (BMC Racing Team) s.t. SVK 19 Peter Velits (Omega Pharma - Quickstep) s.t. ESP 20 Gorka Izagirre Insausti (Euskaltel - Euskadi) s.t. SUI 24 Rubens Bertogliati (Team Type 1 - SANOFI) s.t. IRL 25 Nicolas Roche (Ag2R - La Mondiale) s.t. NED 26 Robert Gesink (Rabobank Cycling Team) s.t. USA 29 Thomas Danielson (Garmin - Barracuda) s.t. FRA 30 Julien El Fares (Team Type 1 - SANOFI) s.t. EST 31 Tanel Kangert (Astana Pro Team) s.t. FRA 33 John Gadret (Ag2R - La Mondiale) s.t. SUI 36 Mathias Frank (BMC Racing Team) s.t. KAZ 38 Dmitriy Muravyev (Astana Pro Team) s.t. DEN 39 Christopher Juul-jensen (Team Saxo Bank) s.t. NED 40 Bauke Mollema (Rabobank Cycling Team) s.t. ITA 41 Damiano Cunego (Lampre - ISD) s.t. ESP 42 Jesús Lopez Herrada (Movistar Team) s.t. NED 43 Sebastian Langeveld (Orica - GreenEDGE) s.t. LUX 44 Frank Schleck (RadioShack - Nissan) s.t. POR 45 Rui Alberto Faria Da Costa (Movistar Team) s.t. ESP 47 Xabier Zandio Echaide (Sky Procycling) s.t. ITA 48 Marzio Bruseghin (Movistar Team) s.t. BEL 49 Gaetan Bille (Lotto - Belisol Team) s.t. SUI 51 Martin Kohler (BMC Racing Team) s.t. CAN 52 Michael Barry (Sky Procycling) s.t. ITA 54 Stefano Agostini (Liquigas - Cannondale) s.t. CZE 56 Zdenek Stybar (Omega Pharma - Quickstep) s.t. USA 57 Levi Leipheimer (Omega Pharma - Quickstep) s.t. RUS 58 Vladimir Gusev (Katusha Team) s.t. ESP 59 Mikel Astarloza (Euskaltel - Euskadi) s.t. AUS 61 Stuart O' Grady (Orica - GreenEDGE) s.t. RUS 62 Vladimir Karpets (Movistar Team) s.t. POR 63 Sergio Miguel Moreira Paulinho (Team Saxo Bank) s.t. FRA 64 Remi Cusin (Team Type 1 - SANOFI) s.t. FRA 66 Jérémy Roy (Equipe Cycliste FDJ - BigMat) s.t. ITA 68 Tiziano Dall'antonia (Liquigas - Cannondale) s.t. ESP 69 Jose Joaquin Rojas Gil (Movistar Team) s.t. ESP 70 Mikel Nieve Ituralde (Euskaltel - Euskadi) s.t. ESP 72 Javier Mejias Leal (Team Type 1 - SANOFI) s.t. ESP 73 Vicente Reynes Mimo (Lotto - Belisol Team) s.t. NED 77 Karsten Kroon (Team Saxo Bank) s.t. ITA 79 Matteo Montaguti (Ag2R - La Mondiale) s.t. AUS 80 Heinrich Haussler (Garmin - Barracuda) s.t. LUX 81 Laurent Didier (RadioShack - Nissan) s.t. ESP 83 Rafael Valls Ferri (Vacansoleil - DCM Pro Cycling Team) s.t. ITA 84 Salvatore Puccio (Sky Procycling) s.t. AUS 85 Baden Cooke (Orica - GreenEDGE) s.t. DEN 86 Chris Anker Sorensen (Team Saxo Bank) s.t. DEN 88 Michael Morkov (Team Saxo Bank) s.t. FRA 89 Lloyd Mondory (Ag2R - La Mondiale) s.t. DEN 91 Matti Breschel (Rabobank Cycling Team) s.t. ESP 93 Igor Anton Hernandez (Euskaltel - Euskadi) s.t. SLO 94 Simon Spilak (Katusha Team) s.t. BEL 96 Johan Vansummeren (Garmin - Barracuda) s.t. USA 98 Edward King (Liquigas - Cannondale) s.t. ITA 99 Alessandro Petacchi (Lampre - ISD) s.t. ESP 100 Pablo Urtasun Perez (Euskaltel - Euskadi) s.t. ESP 101 Oscar Gomez Freire (Katusha Team) s.t. SUI 103 Raimond Künzli (Spidertech Powered By C10) s.t. GER 104 Marcus Burghardt (BMC Racing Team) s.t. UZB 105 Sergey Lagutin (Vacansoleil - DCM Pro Cycling Team) s.t. USA 107 Timothy Duggan (Liquigas - Cannondale) s.t. RUS 108 Alexandr Kolobnev (Katusha Team) s.t. RUS 109 Vladimir Isaychev (Katusha Team) s.t. GER 111 Fabian Wegmann (Garmin - Barracuda) s.t. FRA 112 Sébastien Minard (Ag2R - La Mondiale) s.t. BEL 116 Sander Cordeel (Lotto - Belisol Team) s.t. ITA 117 Elia Viviani (Liquigas - Cannondale) s.t. FRA 119 William Bonnet (Equipe Cycliste FDJ - BigMat) s.t. FRA 120 Anthony Geslin (Equipe Cycliste FDJ - BigMat) s.t. BEL 123 Olivier Kaisen (Lotto - Belisol Team) s.t. RUS 125 Alexander Efimkin (Team Type 1 - SANOFI) s.t. AUS 126 Mathew Hayman (Sky Procycling) s.t. BEL 127 Frederique Robert (Lotto - Belisol Team) s.t. BEL 130 Tom Boonen (Omega Pharma - Quickstep) s.t. BEL 131 Klaas Lodewyck (BMC Racing Team) s.t. USA 134 Lucas Euser (Spidertech Powered By C10) s.t. ITA 137 Morris Possoni (Lampre - ISD) s.t. ESP 139 Ivan Velasco Murillo (Euskaltel - Euskadi) s.t. BEL 140 Jonas Van Genechten (Lotto - Belisol Team) s.t. LTU 142 Aidis Kruopis (Orica - GreenEDGE) s.t. FRA 143 Steve Chainel (Equipe Cycliste FDJ - BigMat) s.t. ITA 145 Davide Vigano (Lampre - ISD) s.t. CAN 147 David Boily (Spidertech Powered By C10) s.t. BEL 151 Gert Steegmans (Omega Pharma - Quickstep) s.t. SLO 152 Grega Bole (Lampre - ISD) s.t.